A review of this installation, in the sense of offering encouragement to go and see it, is a bit redundant. Sadly, it ran for just four days and perhaps, due to the economics of commandeering a whole theatre for the duration of the work, will never be repeated. At the risk of being accused of giving the plot away, a firsthand account of it, a record perhaps, is more apt. A fall into Grace explores Love of the Romantic variety and whilst I am easily transported by the slightest hint of the Romantic Sublime, Romantic sentimentalism leaves me cold. In contrast, anyone familiar with Jackie Chettur’s work will know her handle on the Romantic is well-rounded. Her installation for LOCWS projects, Swansea, last year, was a powerful encounter with the Romantic Sublime. Days later, I found myself humming William Whiting’s ‘for those in peril on the sea’, understanding the words for the first time. I was curious to see her take on Romantic Love. Whilst site specific installation is central to Chettur’s work, these are not spectacles to be passively consumed. For the Swansea piece, it is 89 days since we left the mumbles head, the virtual quality of her stereoscopic images was firmly grounded in the Here and Now by her loosely structured help-yourself delivery. Episodes of immersion in images alternating with a ‘back to reality’ of the blustery Swansea bay foreshore, engendered a profound sense of place and ‘other’ places, Here and There. Expecting to find a similar, slow, quiet unfolding in her latest piece, I wasn’t prepared for just how quiet A Fall into Grace would be. In the hushed, dimly lit upper balcony of the magnificently restored Coliseum Theatre and facing the sumptuous, blood-red drapes of the spot-lit stage, I was stumped. Looking around, other than Art Deco splendour, there seemed nothing to see! And herein lies the problem of reviewing this piece without narratizing it and describing it in detail. While the fabulous images, theatrical handmade props and sound elements that constitute this installation, are works in themselves, for me, Chettur’s artistry lies in stirring resonances in her audiences whereby involuntary minings of our own memories and experiences cumulatively fill out the work, far beyond what she actually presents for us. Hence the outcome requires time and, unbeknown to me, had started the minute I entered the theatre as the artist used its age-old magic to put the outside world on hold. I’m directed towards the balcony, where, just visible in the reflected deep reds from the spot-lit stage, is a row of eight velvet pouches. After the LOCWS piece, I know what to expect: stereoscopic viewers and I know what to do with them. In each are performance stills, actors frozen in sets composed of a mix of the real and Chettur’s artfully cronky, hand-made props; all in the artist’s trademark breathtakingly saturated colour. Across the sequence of eight viewers and in the time it takes to walk from one to the next, a love story unfolds… First Sight – Happy Days of Innocent Bliss – Inconsolable Heartbreak. If there is a final Break-Up or Make-Up we are not told. The images stun with hyper-real, crystal-clear detail and so, whilst the non-romantic in me is unmoved by the banal, broken-heart story so familiar from my ‘Jackie’ reading teens, I engage totally in the eye-tingling business of soaking in the colour, toying with the paradox of flat 3-D layers and visually disentangling the real from her meticulously crafted, exaggerated props. With my eyes glued to the viewer, this is a very private business; only the walk between the pouches to the next ‘instalment’, brings me back to the theatre and awareness of the rest of the ‘audience’, equally lost in their own version of Chettur’s stereoscopic world. Replacing the last viewer brings a sense of ‘THE END’…NO MORE. I’ll never know if the young lovers worked it out. Actually, at this point I’m not bothered. Just a corny teenage picture love story, (without speech bubbles). Who knows what was going on? But there is more. From the vantage of the balcony, in what first appeared in the dim light to be an empty auditorium below, a few people sit silently isolated. 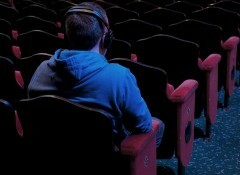 All face the stage, which is curious (there seems so little on it apart from curtains and some podiums) but then, discreet lights on a few seats offer a clue – headphones. We are invited again to slip into a narrative but this time – listening. Six headphones, six stories of love, brought to the artist in response to her ad in the local paper and told by those they belong to. Each is different; the 30 minutes or so needed to listen to them all is totally absorbing. Emotions in the voices speak as loud as the words; a man’s unmistakable triumph, pride and satisfaction at overcoming obstacles in the path of his true love; blissfully happy innocence fuelling the gibbering love-nonsense of a young couple; deep, lifelong sorrow of young love betrayed by a man so addicted to love he marries 7 times … without divorcing once. As these real stories unfold, the unfinished love story in the stereoscopes on the balcony suddenly seems both more and less banal. Its pattern is universal yet here in these stories, real-life ‘Next Instalments’ reveal the maze of accident, betrayal, politics and social mores that love must navigate; ‘trials of love’ beyond anything a ‘pre-love’ teenager reading Jackie could possibly imagine. The stage itself is the final component of the installation. 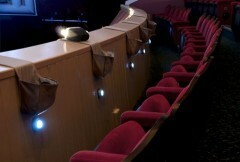 A line of five theatrical, handmade podiums face the auditorium, each topped by a stereoscopic viewer. The images in these are a jolt; each shows the auditorium empty, except for one seat, ‘extraordinarily’ occupied (due to the 3D effect). I recognize each story teller; their seat positions correspond with the headphones, their respective ages identifying who’s who. I jolt, because thus far, the installation has induced a soft, self-absorbed intimacy; first in private viewing of the love story and then in quiet one-to-ones with the tellers of their stories. Now, standing on the stage and ambushed with a gaze from those real, fleshed-out people, each ‘looking at me’, my own love story gets the spotlight, as if, after privileging me with their stories, one or two are anticipating something from me. Their ‘stories’ suddenly expand beyond me, the Coliseum, Aberdare and relocate in the real on-going world outside; a world in which these storytellers are living out their lives and loves, alongside every one of us, including myself. The sheer scale of thought and feeling was a confrontation with something much bigger than me. I resented it, tried to dismiss it, wanting to hang onto my privacy, to hold the voices and stories at a theatrical distance- manageable, but couldn’t. But that was the point. By this deft reversal, the artist confronts us with the chasm between our inner-most romantic myths and our own experiences; between mediated love stories (so mediated they exist only within that medium) and the simple humanity of these people sharing the real life love-quests so inextricably woven into their lives. The corny, stereoscopic love story flashes to mind again – is the quest universal? As I said at the beginning, for me, the power in Jackie Chettur’s work lies in its slow, rich, permeation into consciousness. A more immediate route might have spoon-fed the emotional vicissitudes of Romantic love to her audience; instead, the intervals between components of her installation are integral to the slow unfolding that constitutes the work and, as I found after viewing the LOCWS piece, this unfolding carries on beyond the installation. Days later, with the emotions of the stories lingering, her super-real, eidetic images ready for recall and my resistance to the final portraits on the podium still reverberating, my mental pause, rewind, replay buttons, continue gathering associations long after I’ve left the scene.